Essentially the Nokia 3.1 with an expanded display, the middle-class Nokia 3.1 Plus touts a 6-inch screen that has a wide 18:9 aspect ratio , which resembles the facades of some full-blown high-caliber phablets featured here on Phonerated. 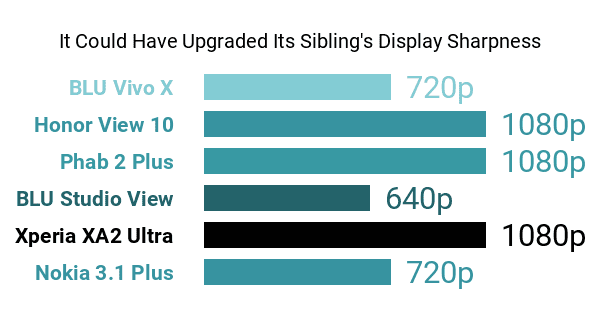 Sadly, it only reminds us of those high-enders insofar as screen real estate is concerned, since it settles for a mundane 1440 x 720 HD+ sharpness -- high-end contenders do not go any lower than FHD/FHD+ (1080p). 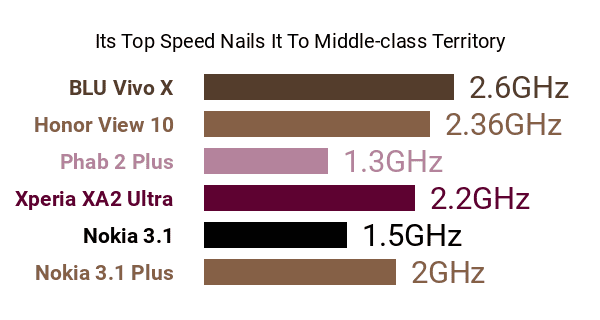 Another telltale mid-end con is its eight-core MediaTek Helio P22 processor, whose 2GHz top speed shudders in comparison to the roughly-2.5GHz clock rates of the best octa-core smartphones available when it hit the market. Its 3GB RAM (A 2GB-only variant is also available) is far from a pro as well, knowing that a lot of 2018 releases with roughly similar specs pack at least 4GB of RAM under the hood. Also among its pros and cons is a dual-lens primary camera that it probably lifted out of the playbooks of the best photography smartphones as of this technical review. It consists of a 13-megapixel main lens with phase-detection autofocus (PDAF) and a 5-megapixel depth-sensing deputy lens that enables bokeh shooting. Its selfie camera is not as appealing, though, coming in the form of a modest 8-megapixel fixed-focus front cam . 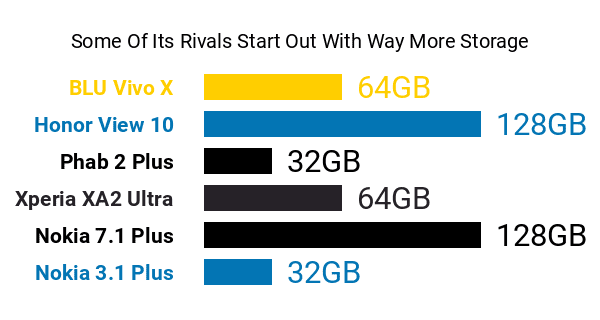 Going back to its hardware composition, the 3.1 Plus does not go all out when it comes to storage, offering either 32GB or 16GB of native eMMC 5.1 memory (depending on the variant), which can at least be expanded by a maximum of 400GB . As for endurance, this 2018 mid-ranger is powered by a non-removable 3500mAh battery promising up to 2 days (2880 minutes) of mixed usage on a single charge. Sure, a few similarly-sized phablets feed off large 4000mAh cells, but given its aforementioned pros and cons, its raw battery capacity sounds just about right. Holding everything in place is a die-cast metal frame, an aluminum cover, and a toughened 2.5D glass covering its screen, with the Android 8.1 Oreo platform greeting users up front. Long story short, Nokia's 3.1 Plus is a large mid-level phablet for those eyeing a dual-camera-equipped Android, but don't want to reach for a full-fledged flagship model just yet.